This Chair is a very popular chair with beautiful wrinkle design in the back. The chair is very comfortable and elegant. This size chairs can be used as premium visitor chairs for top level managers, mid level managers chairs and in places where mid back chairs are good like conference rooms. The chair is in leatherite upholstry. The colour of the chair can be chaged as per customer requirement. 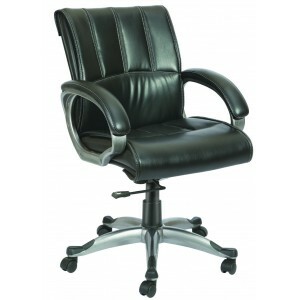 The chair is fitted with Tilting mechanism, elegant designer arm rest with soft upholstry, hydraulic gas lift and strong base with twin castors.